Many imaging devices help to see inside the body, but most overlook minute details except biopsies. Now scientists have developed a method which reduces the need for biopsies and detects diseases faster and earlier, using a combination of laser light, sonic waves and gold. The technique called photoacoustic tomography uses particles small enough to pass through blood. Each particle is one-twentieth the size of a red blood cell and made of a mixture of almond oil and lipids. Inside each particle is a small bit of gold. 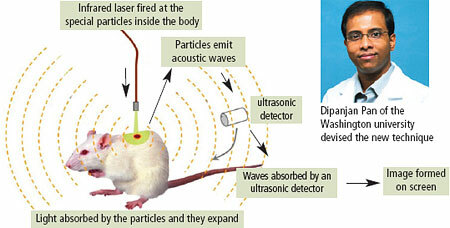 When infrared laser is directed at the particles, they vibrate. An ultrasound detector picks the vibration, and offers a high-resolution picture on screen. The Amazon, the largest river was thought to have formed from upliftment of the Andes mountains. But now it has been revealed that progressive continental tilting is the real force behind the formation and the Amazon started life as a massive swath of wetland. The tilting established an inclined drainage surface that forced water from a giant catchment to flow to the east, about 14 million years ago. The geologists used a computer model to simulate the workings of this giant tectonic conveyor belt, with South America progressively being shifted westward over an ancient tectonic plate. Ever thought of e-paper on paper? It can soon be possible. Scientists have developed a way of using paper instead of glass as a host material for electrowetting used in e-readers. Electrowetting involves applying an electric field to coloured droplets within glass to display text, photographs and video. The new technology will enable ereaders to display content on paper. 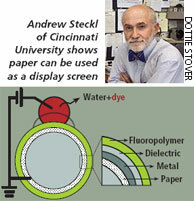 The discovery could pave way for low-cost, disposable e-reader. Scientists have developed a biodegradable foam material that can replace commonly used plastic foams made from petroleum. The new material— made from cow milk protein, clay and an enzyme—is ultra-light in weight. Cow milk protein, casein, can be washed away by water, so the scientists blended it with clay and an enzyme to make it water resistant. Synthetic plastics take many years to decompose. The new material breaks down quickly, with as much as 30 per cent of it decomposing in 30 days and rest faster. There is hope for people suffering from urinary bladder abnormalities like damaged bladder wall. Scientists have developed a method for regenerating bladder tissue. It uses specialised stem cells from one’s own bone marrow. Therapeutic approaches to treat bladder abnormalities rely on surgical intervention which has drawbacks. Stem cells, derived from the middle layer of a tissue (mesoderm), can differentiate into a variety of cell types and have genetic and physiological similarities with smooth muscle cells of the bladder. Applying animal manure on fields is common but there are concerns about the impact that animal hormones may have on surface water. Studies have shown that animal manure may contain estrogen, which is an endocrinedisruptor and poses threat to aquatic and wildlife species. 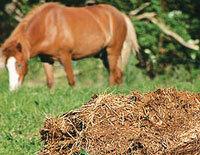 A study has now shown that toxicity of such manure depends on the form it is applied in. It found that manure applied in pellet form has reduced estrogen. The study was conducted on plots in the US. Corn was planted as crop and chicken manure was applied as a pellet and in raw litter form. Thought only humans are choosy about what they eat? Koala bears are also particular about their food. They are the pickiest marsupials around. They have evolved to feed exclusively on the leaves of eucalyptus, and they are highly selective when it comes to species and even individual trees they visit. The bear checks for a number of factors, including taste, to make its selection. To define palatability in terms of koala, the researchers tested leaves on captive koalas and recorded how much they ate. 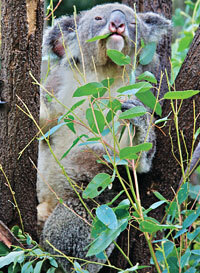 They found that the koalas ate less foliage when it contained lots of lipid-soluble phenolic chemicals. They also noted that koalas spend more time in large trees. Trees were visited more often if they were surrounded by smaller, less palatable trees or by larger, more palatable trees. This can help ecologists map habitats of animals. Plants like jute, sugarcane and millet evolved 14 million years earlier than thought. Known as C4 grasses— because they release a compound of four carbon atoms during photosynthesis—they were thought to have evolved when the levels of atmospheric carbon dioxide dropped during the Oligocene epoch. These grasses very efficiently utilise carbon. A new analysis of fossilised grasspollen grains deposited on an ancient European lake and sea bottoms 16-35 million years ago has revealed that C4 grasses are older. C4 grasses comprise only three per cent of flowering plant species, but account for 25 per cent of global terrestrial productivity. It is an accepted law of physics that antimatter atoms exist. But none of it had been isolated so far. Now scientists have confined such atoms in a magnetic trap. 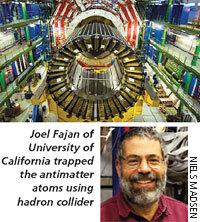 The makeup of antimatter has been one of the biggest challenges facing science. Scientists believe that at the Big Bang, matter and antimatter were produced in equal amounts, but antimatter disappeared. Antimatter has been very difficult to handle because matter and antimatter do not get along. When forcibly combined, they destroy each other instantly with a flash of light. Earth’s largest lakes have been warming in the past 25 years due to climate change. Researchers analysed satellite data of 167 lakes since 1985 to measure surface temperatures. They found an average warming rate of 0.45°C per decade, with some lakes warming as much as 1°C per decade. The most consistent area of warming is northern Europe. The highest surge in temperatures were reported in mid to high latitudes of the Northern Hemisphere.